Do AC/DC sales equal economic doom? 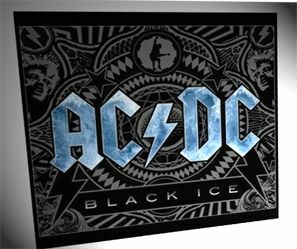 In one of the most astonishing music stories of recent years, AC/DC's Black Ice has raced to the Number 1 album slot in the UK and is likely to do the same in the USA. Black Ice is the veteran band's first release in eight years, their first Number 1 in 28 years, and has made a huge impact at retail outlets. In the US, Black Ice is available only via Wal-Mart (who have reportedly purchased 2.5 million copies of Black Ice on a no-return basis). In the UK, Black Ice outsold Kaiser Chiefs' Off With Their Heads by nearly two-to-one. And the album is not available to buy digitally, via iTunes or any other digital retailer. Black Ice is available on CD and vinyl only. The UK's Guardian newspaper claims Black Ice has sold 5 million copies worldwide in its first week, which is astounding in current times, though the paper's pop critic Alexis Petridis argues that AC/DC's success means very tough times are ahead. He points out that AC/DC's biggest-selling albums - 1980's Back In Black, 1990's The Razor's Edge and 2008's Black Ice - have all coincided with recessions. And AC/DC released their first album, in 1973, just at the onset of the oil crisis. When the economy was more buoyant, say in 1985, the AC/DC album of that year (Fly On The Wall) was a relative flop. "AC/DC's appeal in unpredictable times is straightforward," argues Petridis, likely with his tongue in his cheek. "People crave something uncomplicated and dependable in a time of uncertainty, and rock music has never produced a band so uncomplicated and dependable as AC/DC." Is that really the appeal of AC/DC? Does their no-fuss rock'n'roll make hard times easier to tolerate? Or is Black Ice simply one of their best albums? All MusicRadar knows is that AC/DC's guitar crunch deserves some credit.